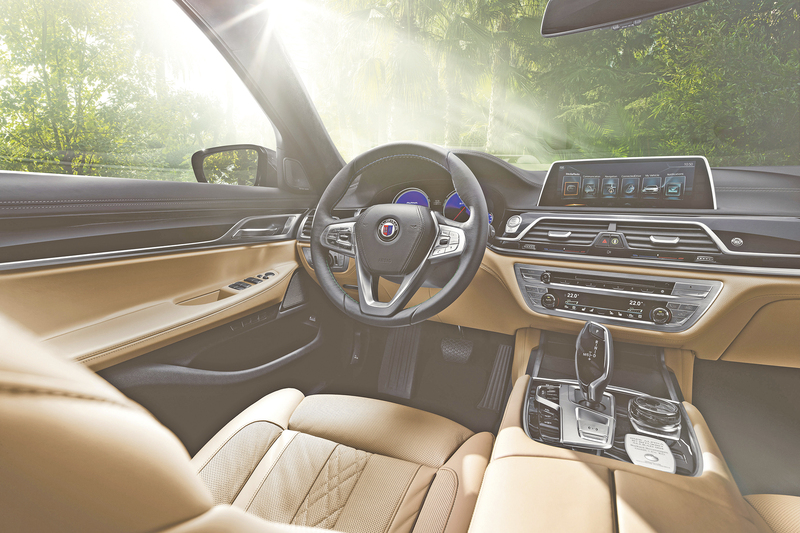 Alpina’s new supersaloon – the B7 Bi-Turbo is now available in the UK with a final specification that pushes top speed to an astonishing 205 mph, up from the 193 mph predicted at the Geneva launch. With an Alpina-optimised 4.4 litre V8 delivering 608 hp (up from 600 for the show car) and 800 Nm, the new B7 Bi-Turbo joins the exclusive group of cars with effortless 200 mph performance. To help achieve this impressive combination of performance, comfort and driving dynamics, Alpina’s 70-strong engineering team has received exceptional access to BMW design data and technical facilities as part of a relationship that reaches back to 1964. 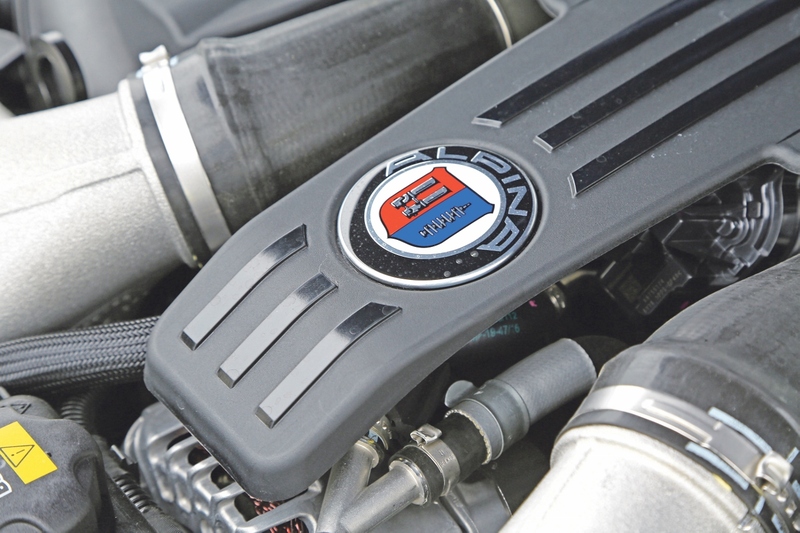 This was the year when BMW endorsed the quality of Alpina products by awarding the full factory guarantee to BMW vehicles fitted with the new Alpina dual carburettor system. At the heart of the new B7 Bi-Turbo is a heavily-revised, direct injection V8 breathing through two specially-developed, twin-scroll turbochargers located between the cylinder banks, operating in parallel to deliver up to 1.2 bar with minimum inertia. 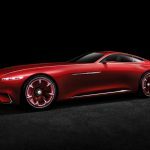 Particular attention has been paid to airflow optimisation, with a new wide-bore intake system providing shorter intake paths and optimised radii to allow near-instant throttle response. Pistons and spark plugs are uprated to ALPINA specifications. A new indirect intercooler system (air/water/air) further improves both power and responsiveness, with a main intercooler feeding the two large-volume, close-coupled intercoolers. Together with additional radiators, the system ensures the thermodynamic stability of the V8 Bi-Turbo engine at all times, even under the highest sustained loads and most aggressive ambient air temperatures. The eight-speed automatic transmission also receives additional cooling, alongside a host of modifications that include strengthened gear clusters and a larger torque converter. 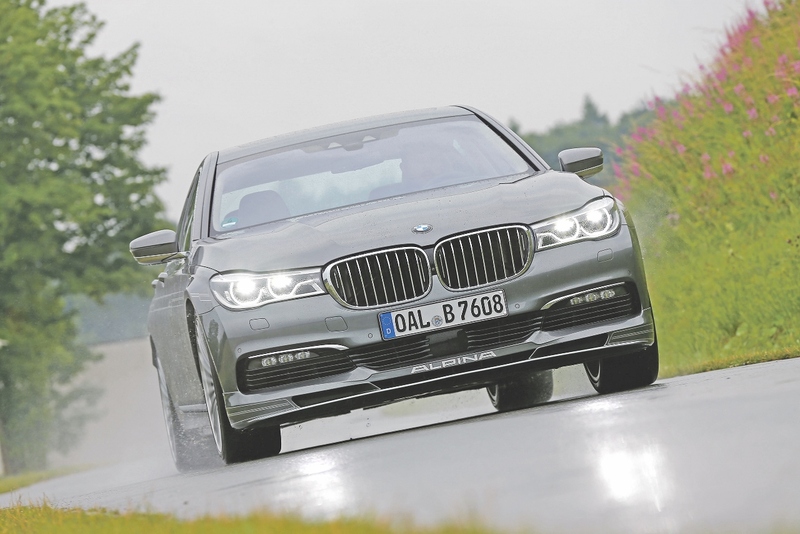 Alpina’s work with transmission supplier ZF is another reason for the exceptional acceleration of the new B7 Bi-Turbo. The result of extensive analysis to ensure durability at high mileages, its immense strength means that the torque reduction commonly applied during upshifts is not required. The transmission can be controlled manually using the Alpina Switch-tronic buttons on the back of the sports steering wheel. 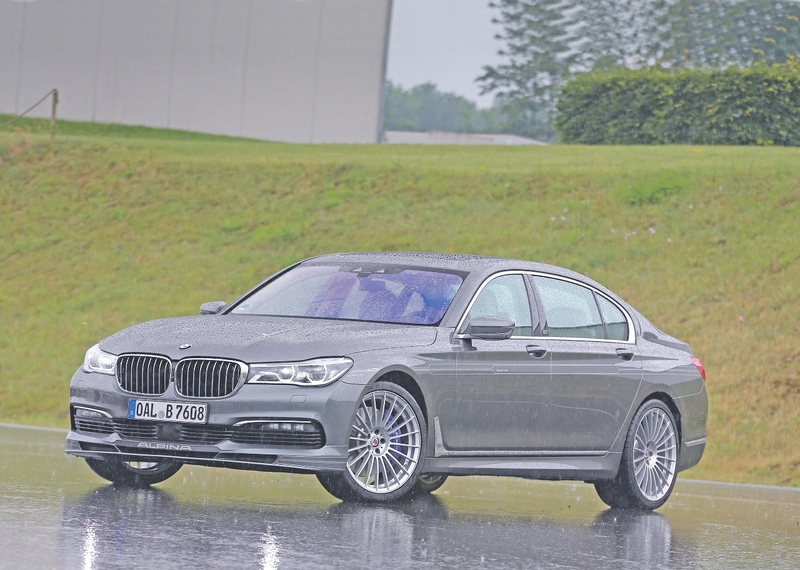 The Alpina B7 Bi-Turbo is an evolution of the latest BMW 7-Series, which provides a state-of-the-art, high-technology development platform. 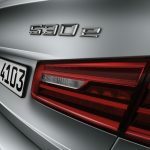 To reduce weight, for example, the 7-Series BMW’s A-, B- and C-pillars, the transmission tunnel and the windscreen header are all made from carbon fibre composite. Alpina’s chassis electronics specialists have also developed their own calibrations for the Dynamic Traction Control system to ensure that the characteristics of the engine and transmission can be fully exploited for maximum driver enjoyment. At the touch of a button, this remarkable vehicle sharpens to provide the agility and lateral dynamics normally associated with a more focussed sportscar, while in Comfort Mode it retains the ride quality of a luxury saloon. In this specification, the new ALPINA B7 Bi-Turbo will accelerate to 60 mph in just 4.0 seconds. Wheels are 20” Alpina Classic 20 spoke in a new design made from high-strength, forged aluminium with visible wheel bolts and no centre hub covers. 21” wheels are optional. Aerodynamics have been optimised in BMW’s wind tunnel and are enhanced by unique ALPINA front and rear spoilers that also increase airflow through the uprated cooling system. The bespoke look is further enhanced by a four-outlet, light weight stainless steel Alpina sports exhaust system that has been tuned to reduce back pressure as well as providing a choice of two driver-selectable, bass-focussed sounds.